Old Havana and its Fortification System represents a historically important colonial city. Havana was founded by the Spanish in 1519 in the natural harbor of the Bay of Havana. It became a stopping point for the treasure laden Spanish Galleons on the crossing between the New World and the Old World. The designated area consists of a set of 18 fortifications along the coast and the harbour, the old city center (Habana Vieja) and 19th century extensions. The Castillo de la Real Fuerza is the the oldest extant colonial fortress in the Americas. Other important remaining castles include Castillo del Morro, La Cabaña fortress and San Salvador de la Punta Fortress. The pattern of the early urban setting has survived in the historic centre. Havana wasn't really what I had expected. The included area spans only the Habana Vieja quarter and the fortresses. On my first morning in the city I walked and walked, thinking "where is it going to start?". I finally arrived at the much restored Plaza Vieja. 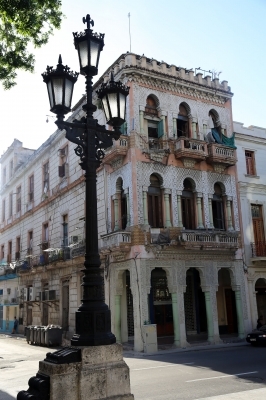 Most of the streets in the core of Habana Vieja have been renovated as well. I had anticipated a bustling atmosphere, but this is just a couple of brushed up Spanish colonial houses. White, camera-toting tourists I met in abundance. The full name of the WHS is "Old Havana and its Fortifications", and it were these Fortifications that I came to truly enjoy. The best two are on the other side of the harbour: Morro and Cabana. It's a nice and quiet area to walk in, and the views on the city are spectacular. Morro has an interesting exhibition about the travels of Columbus, and models of other fortifications around Cuba. There even is a good restaurant (12 Apostles). All around the harbour and coast smaller and bigger forts were built during various centuries, and you can still see them. Inspired by the recent Connection "Equestrian Statues", I was attracted to a huge statue of a man on a horse that can be seen from the fortresses on the other side. This one, of Maximo Gomez (a general during the Ten Years' War and the War of Independence) probably is the most majestic one that I have ever seen. It was sculpted by an Italian, very neoclassical. The history of Havana is way too long and complex to be described here, I will therefore limit myself to describe my feelings for this wonderful place. The inscription in the World Heritage List is justified by the integrity and authenticity of Old Havana and the fortifications: the architecture, the monuments, the nearly perfect grid layout, the general atmosphere of the place. All these factors make it feel like time has stopped at some point in the past, when Havana was a glorious city, although it is now decadent with lots of empty and abandoned buildings everywhere. This contradiction is absolutely fascinating. A walk around the streets of Habana Vieja will captivate any visitor. The place is vibrant, music is played everywhere (and often very loud), people spend a lot of time on the streets, playing chess or domino, dancing or just sitting on a step and smoking a badass cigar, kids play soccer and locals visit the ubiquitous PCC (Communist Party of Cuba) offices. The atmosphere is just addictive. It is too easy to start chatting with someone who invites you to dance with them on the street. But it’s not only about the vibrant atmosphere, Old Havana has also a lot of very interesting sights to visit. The plazas (Plaza Vieja is so pretty! ), the churches, the Capitolio, Calle Obispo and Calle Mercaderes, the paladares (privately owned restaurants) and the bars. Another distinctive sign of Havana is the unfailing presence of the classic american cars that are featured in any photo of Cuba. The conditions of some of these cars are unbelievable, they look like they were made yesterday. 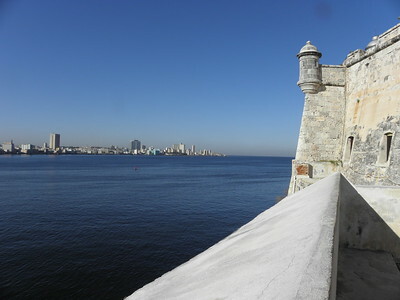 The fortifications are located on the east bank of Havana Bay, across the entrance Channel, which they dominate, and can be reached by a short taxi ride from Old Havana or by public bus. 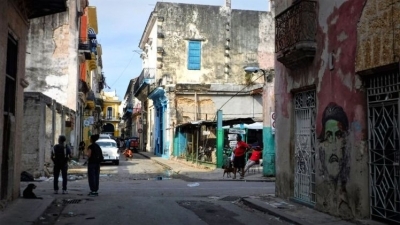 On the west of the Old Havana is found Havana Centro, with the small Chinatown (where no Chinese people live anymore) and Vedado, where most of the fancy government-run hotels are located. It is also worth to spend some time exploring Vedado as there are located the Colon Cemetery and the huge Plaza de la Revolucion, famous for the faces of Ernesto Che Guevara and Camilo Cienfuegos (heroes of the Cuban Revolution) engraved on the facades of the building surrounding the square and the monument to José Martí. I spent a total of 4 days in Havana and I’m not sure it was enough. It definitely was more than enough time to visit everything I wanted to see and I even managed to spend half a day on the beach at Santa Maria (one of the so-called Playas del Este), but it wasn’t enough to fully enjoy the atmosphere of the city. I felt like I was leaving too early and there were more aspects of the city to be experienced. Keep also in mind that, especially in high season, there are a lot of tourists and the lines for everything can be painstakingly long. The queue at places like the Museum of the Revolution, the exchange bureau, the Etecsa Telepunto (the internet office), but even getting a drink at popular bars such as La Bodeguita del Medio o El Floridita, or buying ground coffee at Café El Escorial (a must for coffee lovers), can easily take well over an hour, if not two. The most famous and popular tourist attraction in the whole Cuba. Old Havana or Havana Vieja is the entire world of twisting streets with colorful dilapidating buildings and rich history behind. The city of Havana was founded by the Spanish in the 16th century and due to its strategic location it served as a springboard for the Spanish conquest of the Americas, becoming a stopping point for treasure-laden Spanish galleons returning to Spain. The most significant fortress system of Havana, the military-historical park El Morro – Cabaña, is nowadays is a big touristic complex, which reflects the history of Havana during the last five centuries. In some buildings you can find museums, including the museum of ancient armaments and the museum of Che Gevara. Every night at 21:00 a cannon is fired, the so-called "El Cañonazo de las 9", a custom kept from colonial times significating the closure of gates in the city wall. Now it symbolizing another shiny day in Cuba. There is strong feeling that this old fashioned Havana with its bizzare 60-year old cars and empty state shops will be gone soon. And we can't conclude whether it would be good or bad, certainly should be better for the locals. We were a little bit upset by a huge number of touts and tourist traps, which started to appear only recently. But if you get up early before crowds and stroll in the old centre, you will probably catch a glimpse of real Havana spirit. A soldier clad in 18th century uniform walks through the crowd wielding a torch, which he juggles like a bowling pin. This is the first part of an age-old ceremony, where the Spanish army would warn pirates that they weren’t welcome. Calling for silence in this solemn event, he’s soon joined by others similar dress. One carries a cannonball, the other gunpowder. They do their job and ker-POW! That’s it. The ceremony’s over and the crowd begins to disperse, but one cannot help but think that what they were really aiming at was not ancient buccaneers, but Florida 90 miles to the northeast. This is Cuba, America’s nemesis, and forbidden fruit for tens of thousands of Yankee tourists every year. The government won’t let us go. What better reason to try? I visited old Havana and the impressive fortifications of 'el morro' in November 2008. The old city is really impressive and some of the colonial buildings are being restored. One can attend Mass at the main church and the old plazas are a reminder of how important Havana was in the trade with Seville during the Spanish Golden Age. Adding to old Havana's charm is the Caribbean and tropical flair and the strange timewarp presented by all that remains from pre revolutionary Cuba. From "Old Havana and its Fortifications" to "Old Havana and its Fortification System"
Piracy: "Havana was originally a trading port, and suffered regular attacks by buccaneers, pirates, and French corsairs. The first attack and resultant burning of the city was by the French corsair Jacques de Sores in 1555. The pirate took Havana easily, plundering the city and burning much of it to the ground." Che Guevara: "In January 1959, rebels led by Che Guevara captured La Cabaña, to use it as a headquarters and military prison for several months, while leading the Cuban revolution."